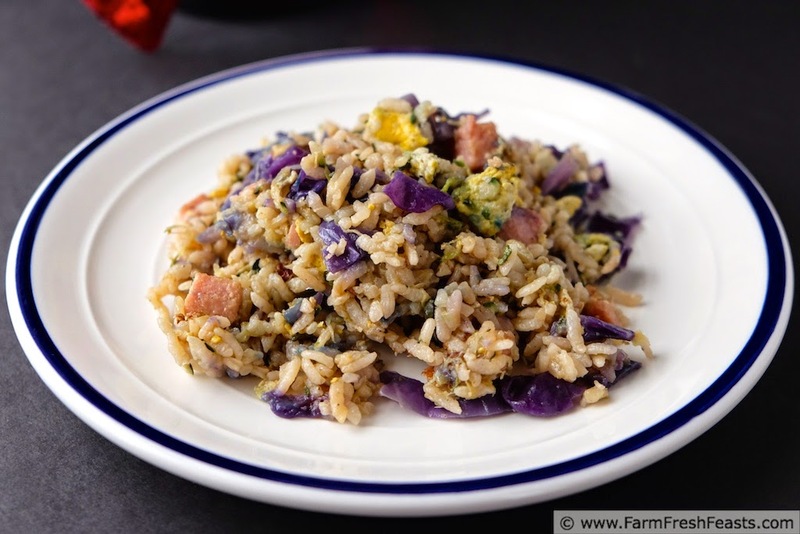 The colors of Mardi Gras in a fried rice--red cabbage, eggs and zucchini (with or without ham)--make this savory seasonal dish a colorful way to let the good times roll. Why do Mardi Gras recipes have to involve pancakes or King cake? Can't we have some savory entrees alongside? I'm pretty sure the carbs and protein would help with alcohol consumption. Howdy! I'm feeling a little sheepish here because if you subscribe via email [hey thanks!--if you don't, there's a widget along the right sidebar that makes it easy to do so] you'll know I messed up yesterday. See, I'm only sharing 3 recipes a week, but I'm cooking for the family, the team, the folks at work, and others all. the. time. Any given week I've got a bunch more than 3 recipes that have the potential to be blog-worthy. These recipes pile up in notebooks and on scraps of paper. The photos pile up--in a well-organized fashion--in my laptop. Eventually I get around to typing them up for the blog, and when I do I tentatively schedule them for when they'd be appropriate. I've got a small butternut squash & spinach lasagna recipe from last year that I thought would be good for February. I scheduled it for 2/1/2015 thinking that I'd sort out which Monday, Wednesday, or Friday would be best and get the post all buffed and shined [i.e., add photos and the sort of writing you're reading now]. Except I didn't realize that yesterday was February 1st, and there I was at Costco taking photos of my spouse while he tried on new eyeglass frames. [Ya know, if you need to wear glasses it's really hard to tell what you'd look like in new frames since you can't see out of them while you're trying them on . . . where was I?] 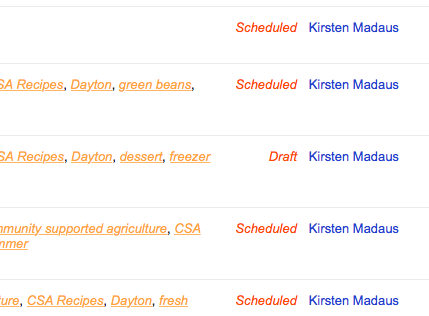 Oh, right--so while I was at Costco the partially finished lasagna post automatically published, per the scheduling I did last year, and went out on email. I came home from the store to emails from my mom and Alanna notifying me. Whoops. Now the cool thing of this very long and involved rambling is that Alanna taught me how to save all my partially finished posts as drafts, so theoretically this type of thing will never happen again. But I'd still appreciate it if you'd sign up to get the blog via email, because everyone likes bloopers now and again. This recipe is not a blooper--but it was evolving as my daughter and I were cooking so I don't have a single pre-cooking photo and instead only artificially-lit mid-progress 'hey this could turn into something I'd better document it' photos. It's fast to throw together if you've got precooked rice, and because of the resulting purple/yellow/green color it made me think of Mardi Gras. Leave out the ham if you don't care for it/don't have any, and you'll still have a savory fast supper. Note: You will need 3 cups cooked & cooled rice, I use medium grain, so start that according to package directions if you don't have any on hand. 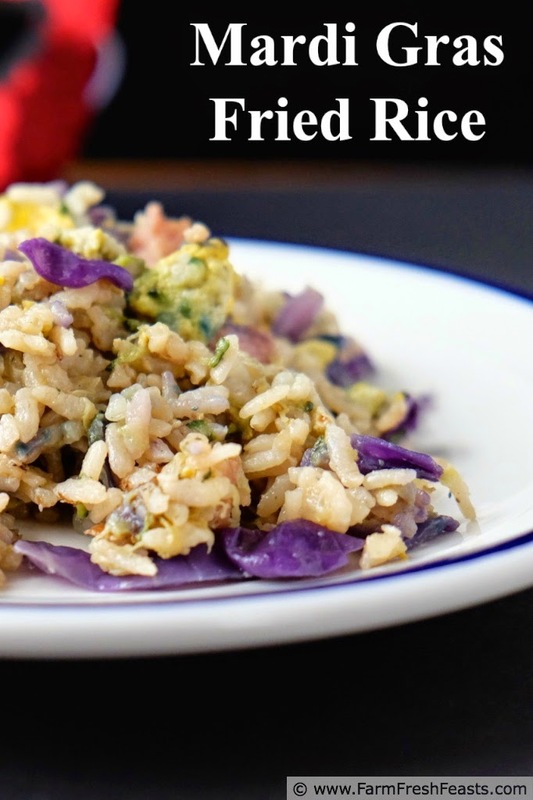 While I was surprised by the last minute addition of the red cabbage from our community supported agriculture (CSA) farm share, I'd planned to make fried rice for dinner so I was all set with the rice. I had no intention of adding cabbage. That was all my daughter's idea, so only the zucchini, onion, egg and ham are ready. Try as I may, I can't get the color right with artificial lighting. 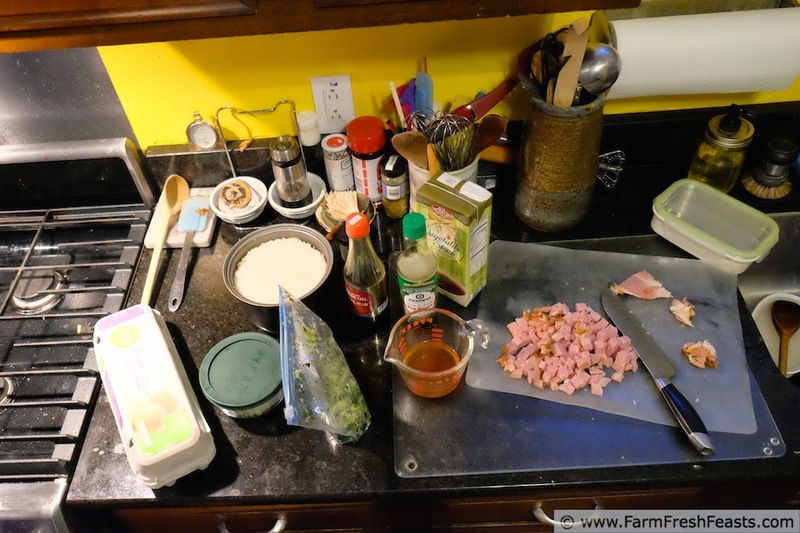 In a small bowl or 1 cup measuring cup, mix together broth, soy sauce, ginger and sesame oil. Set aside. Preheat a large skillet over medium high heat and add vegetable oil. Sauté onion for 3 minutes or so, turning frequently to keep things moving. Stir in zucchini shreds and cabbage, coat with oil, and sauté another 5 minutes or so until the veggies are starting to soften. Push them to the perimeter of the skillet and crack the eggs in the center as shown above. Once the whites are set, scramble the yolks and let them cook for a minute before stirring the vegetables into the center. Add the ham and combine thoroughly. Stir in rice, then pour over the broth mixture and reduce heat to medium low. Flipping and folding, coat the skillet contents with the broth and heat through (another 3 minutes or so). Serve with additional soy sauce at table. This is shared with What's Cookin' Wednesday. Oh no. It happens. Yesterday I published a post without the recipe. Duh! I love all the colors in this dish. It would be perfectly festive for Mardi Gras. Doesn't it just make you batty when you realize you've forgotten something? If those are your artificial lighting photos I am jealous! They look awesome! And I love this idea for a Mardi Gras dish! The photos on the plate are my daughter's lunch, since she comes home and eats up my leftovers many days ;) . But on the stove--all nighttime stove lights and boy does it show. Ah well, keepin' it real. I love the idea of savory dishes for Mardi Gras. There are certainly enough sweet recipes out there. This recipe sounds so simple and delicious with so many tasty ingredients. I love seeing all the gooey chocolate desserts, but the fact is that we don't eat like that--we eat like this ^ so I may as well share. what a FUN dish, and perfect for Mardi Gras! I love bright and vibrant colors in my food, and agree about needing more savory for most events! Eating bright colors just makes me happy--especially so in the wintertime. We are fried rice lovers at our house. This looks delicious! The red cabbage really brightens it up! My daughter learned how to make fried rice during her home ec class (which has a much more modern name that escapes me). I like how she's learning--at school--how to use up extra meat and veggies in a new way. Brilliant!!! How fun is a Mardi Gras rice? Totally! Thank you again for learnin' me something new about this blogging thing! I suppose it's keeping my mind agile? I love that the cabbage addition was the daughter's idea. Man oh man, I live for the day when the Hubby suggest something similar. While I won't be holding my breath, he did make Brussels sprouts all by himself last week, and I never thought I'd see that happen. Awww, he's growing up! That's pretty cool--I remain the only one in my family who initiates the Brussels sprouts, though the rest of the inhabitants of this house will eat them once I've made them. At least a couple. 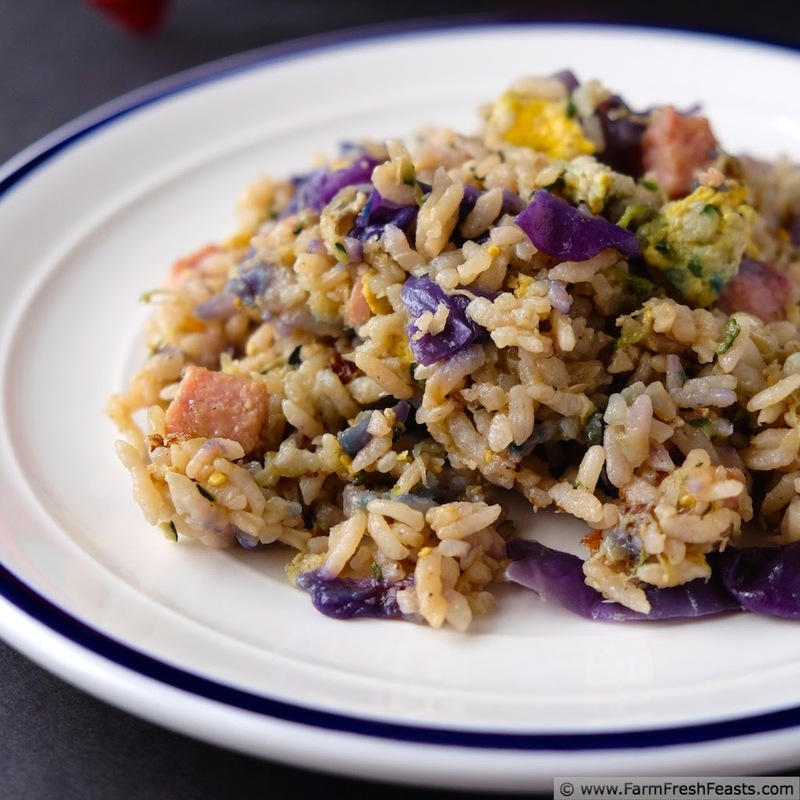 Love the added zucchini, cabbage and ham in this fried rice version! 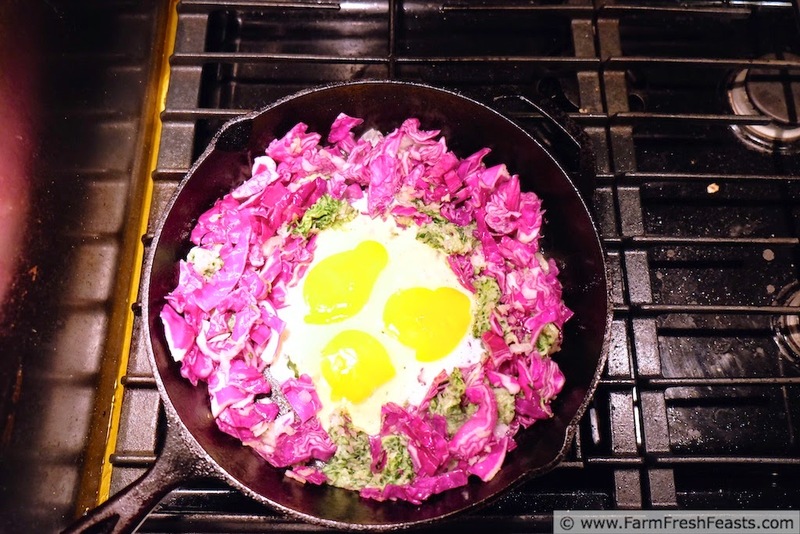 The purple cabbage really does give it a fun Mardi Gras look! FYI: I commented prior with my Name/URL, using Google this time. I'm sorry my comment program is not working. I've tweaked the template of the blog to be more IE-friendly, and I hope that helps. I'm glad I'm not alone. Besides the dashboard there's a spiral notebook sitting next to me with recipes and headnotes waiting to be typed into the dashboard! I was doing good during November, heading to the library each Friday night for a NaNoWriMo Write In, but after that designated time I just lost the habit. I love when vegetables make a dish so colorful and enticing. I feel your pain with artificial light photos. I am often cooking and serving at night, so I have the same problem. You are lucky you had enough leftovers for a daytime glamour shot. I have plenty of great recipes waiting in draft because I need a daytime photo. I'm just glad my family likes leftovers (and that my daughter comes home for lunch)! Left to my own devices I'll be so happily satiated from my mid-morning oatmeal that I'm not really into lunch. I suppose there's always weekend lunches . . . It's more fun to eat colorful food!